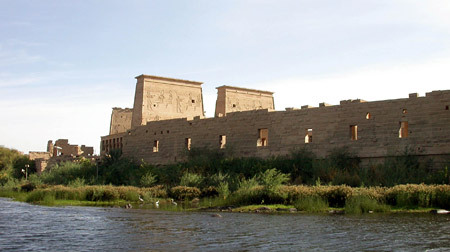 South of Aswan, in the middle of a granite rock which projects out of the blue Nile is the Island of Agilka which is the site for the relocation of the holy temple Philae, a complex dedicated to Isis, built by the Ptolemen. When the High Dam was built the temple was flooded and was dismantled and moved to the island by UNESCO. 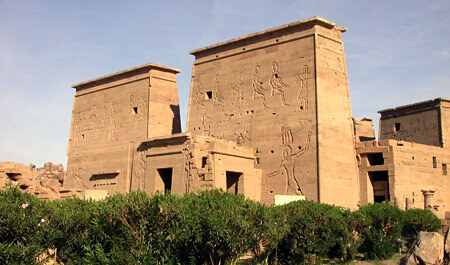 In the temple complex Isis, Osiris and Hathor, Chnum, Nephtys and Satis were worshipped. The 45m wide and 18m high Pylonen show Ptolemaeus III on the wall.